The history of swing dance is as colourful as it is exciting. Our dance school students get just as much enjoyment as the greats of the swing dance era did and our monthly events make sure our dance school students can relive the magic of the era as well. Swing dancer extraordinaire Frankie Manning was a leading dancer at Harlem’s legendary Savoy Ballroom where, in the mid-1930s, he revolutionised the course of the lindy hop with his innovations, including the air step. As a featured dancer and chief choreographer for the spectacular Whitey’s Lindy Hoppers, he performed in numerous films (including Hellzapoppin’ (1941)), and entertained on stages around the world with jazz greats Ethel Waters, Count Basie, Duke Ellington, Ella Fitzgerald, and Cab Calloway. Upon the demise of the Swing Era, Frankie took a job in the Post Office, where he worked for thirty years until his rediscovery by a new generation of swing dance enthusiasts in the mid-1980s. From then on he was in constant demand, teaching, choreographing, and performing globally. He won a 1989 Tony Award for his choreography in Black and Blue, and served as a consultant for and performed in Spike Lee’s Malcolm X. Frankie’s activities have been chronicled in hundreds of articles (including features in GQ and People) and dozens of news programs (including a profile on ABC’s 20/20). Considered the world’s leading authority on the lindy, he is highlighted in Ken Burns’s acclaimed documentary, Jazz. His autobiography, Frankie Manning: Ambassador of Lindy Hop, co-written by Cynthia R. Millman, was published by Temple University Press in spring 2007. Norma Miller – also known as the “Queen of Swing” – is one of the greats of Lindy hop and is the last surviving member of legendary performance troupe Whitey’s Lindy Hoppers. She is also an author, choreographer, comedian and actor who has worked in show business for over seven decades. Born in Harlem, New York in 1919, Norma’s dance career began at the age of 12 when she was approached outside the Savoy Ballroom by Twist Mouth George. After winning the Savoy Lindy Hop Contest in the early 1930s, Herbert “Whitey” White asked Norma to join his group, Whitey’s Lindy Hoppers, whose members also included Lindy hop legend Frankie Manning. With Whitey’s Lindy Hoppers, Norma performed on Broadway and in motion pictures including A Day at the Races (1937) and Hellzapoppin’ (1941). She has remained in show business ever since and has continued to appear on television, film and in documentaries. 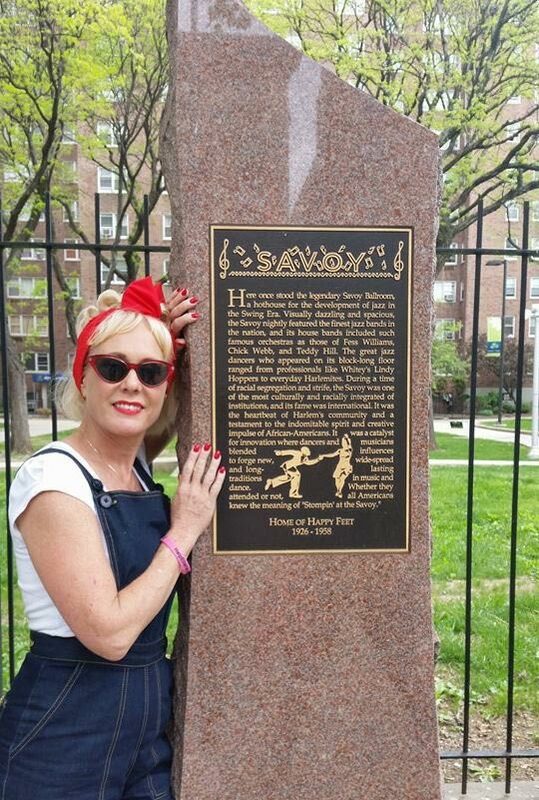 Today, Norma continues to appear regularly at Lindy hop events around the world. THE SAVOY BALLROOM: HOME OF THE HAPPY FEET. The Savoy Ballroom opened its doors on December 14th, 1926 and closed in 1958. Owned by “Gangster” Moe Paddon who some say was just a front for Chicago’s Al Capone. The Savoy was a two-story ballroom which spanned the whole block of 140th. street to 141st. street on Lenox Avenue in (Uptown) Harlem, New York. The Ballroom itself was huge, and something that we could only dream about. It had two bandstands, coloured spotlights, and a dance floor that was rectangular (nicknamed the track) and was over 10,000 square ft. of spring loaded, wooden dance floor. The place was a hit. The floor had to be replaced every three years due to its tremendous use. The Savoy could and very often would hold up to 4,000 people with about 15% of the people being white. Depending on who the band was, the ballroom would more than double its capacity. 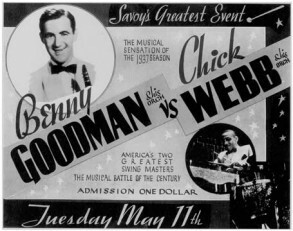 When a fella by the name of Benny Goodman brought his big band to play at the Savoy it was reported that there was approximately 25,000 people waiting to get into the ballroom. The Orchestras were paid $1,200 a week to play the Savoy. The club was only open to the public five nights a week, with two days were reserved for private Parties/Functions. The normal Cover Charge was between $0.30 cents to $0.85 cents in the early 1930′s. During the depression, the cover was lower and the Savoy would setup free Holiday dinners for the homeless or poor folks in the area for free. 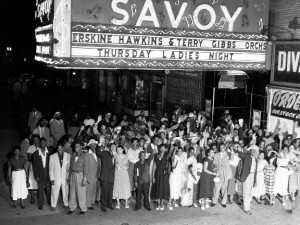 The Savoy was allowing inter-racial dancing of Blacks and Whites, which was frowned upon by both races at the time at other night spots, but not at the Savoy. The Savoy hardly had any problems with fights or trouble makers due to racial issues. People learnt to overlook their differences and respect the true meaning of the Savoy, it’s music and dance. With Lindy Hop being said to originate at the Savoy, the ballroom was known as the “Home of Happy Feet” and had the best Lindy Hop dancers in the Nation. The best of these dancers would hang out together in the North/East corner of the Savoy, known as “Cats Corner.” The leader of the pride was Hubert “Whitey” White and the group was commonly known as “Whitey’s Lindy Hoppers.” Whitey’s right hand man was none other than Frankie Manning who later took over as their leader. 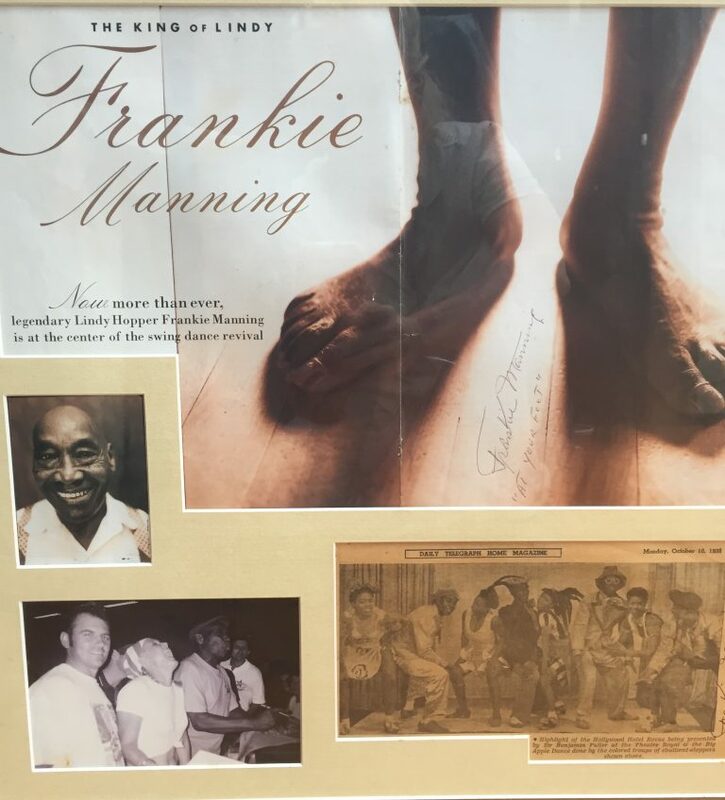 With a career spanning such a long time, it is no surprise that Frankie Manning worked with several regular dance partners. When the Lindy Hop first came of age in the 30’s, the raw Frankie had a dazzling dynamo of a performer in Ms Freda Washington. Living next door to each other, Frankie and Freda grew up dancing together. Freda is of course famous for being half of the partnership (with Frankie) to perform the first air-step and as a member of the incredible Whiteys Lindy Hoppers. After the end of Lindy Hop’s golden era, Freda moved on to other parts of her life and little information of her whereabouts appears to be available. 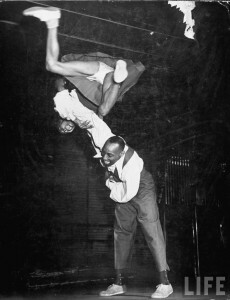 During the time of Whitey’s Lindy Hoppers, Frankie also regularly partnered Willa Mae Ricker, who was well known for her amazing physical strength and passion to dance. Frankie Manning & Willa-Mae Ricker: Just after the Congaroos ended. Although Willa Mae and her husband, Lindy Hopper Billy Ricker, were high school sweethearts and enjoyed a long and healthy marriage, they rarely danced together professionally. Willa Mae partnered Frankie, Leon James, Al Minns, Russell Williams and others, winning the first Harvest Moon Ball with Leon James in 1935. During World War II, when so many of Whitey’s Lindy Hoppers were serving in the armed forces, Willa Mae managed the Harlem Congeroos, considered Whitey’s greatest group. When Frankie returned from the Pacific in 1947, he took over the management and Willa Mae continued as a dancer in the group, known simply as the Congaroo Dancers. Willa Mae’s passion and determination amazed all when she overcame an emergency hysterectomy to re-join the show in a remarkably short time. After the break-up of the Congaroos in the late fifties, Willa Mae enjoyed a career as a model. With keen sense of style and business savvy, she was able to make a successful second career in fashion. Willa Mae died of cancer in the sixties, having never lost her love for Billy, the will to dance nor the sweet disposition that made her the most beloved of the Lindy Hoppers. Hellzapoppin’, Hot Chocolate and Killer Diller, but she is perhaps most famous for appearing in photos twice with Frankie in Life Magazine. One featured her anonymously in the amazing “Over the Head” shot of 1940 and the second in a 1941 photo, mid-air during an aerial sequence. Ann also partnered Frankie in the Harlem Congaroos from 1947-52, before the break-up of the group and the decline in popularity of the Lindy Hop. When you spend a great deal of time with someone, it’s regular that one of two events happen; you get extremely sick of the sight of them or perhaps a fledgling romance develops. Frankie was no different… in the romance stakes that is. Frankie partnered Lucille Middleton at the Cotton Club and in movies such as Radio City Rebels, Manhattan and Mary Go Round, but also became romantically involved with her in the late 1930’s. Norma was first discovered as a gifted young dancer when she was just 14 years old. Too young to enter the Savoy Ballroom, she would dance outside on the pavement where the music could still be heard. Herbert “Whitey” White is credited with bringing Norma to fame, inviting her to join Whitey’s Lindy Hoppers, after watching her defeat his dancers in a savoy contest. Frankie Manning & Norma Miller. From the start, she was a very creative dancer with her own, often comic, style and possessed an outstanding sense of rhythm. A vivacious and outspoken person, she was and still is always the life of every party. As a comedienne, Norma worked in Las Vegas with for over 10 years, including appearances in the TV show, Sanford and Son where she is remembered as the airline stewardess who offered “Coffee, tea or ME?” In the seventies, she formed another Lindy Hop and jazz performance group, the Savoy Swingers. 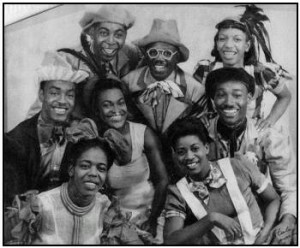 In addition to many standard entertainment venues, this group did a series of performances in the New York City public school system, introducing African-American dance history to the new generation. Today, Norma continues to work as a comedienne and choreographer in Las Vegas, as well as publishing her autobiography Swingin’ at the Savoy in 1996. The ‘apple dancers’, as they came to be known, performed in Melbourne at the Princess Theatre from January to March in 1939. The dancers were: Frankie Manning, Snookie Beasley, Jerome Williams, Bill Ricker, Willamae Ricker, Esther Washington, Eunice Callen and Lucille Middleton. They were the finale act for a show called the ‘Hollywood Hotel Revue’ which toured many cities of New Zealand and Australia including Christchurch, Brisbane, Sydney and, of course, Melbourne. The revue was brought to Australia by Sir Benjamin Fuller, produced by Harry Howard and originally from the Winter Garden in New York. The show was compered by Maety May and featured two famous comedians, Willie and Eugene Howard, who had appeared on Broadway and in film. It also contained acrobats, dancers of various kinds, singers and more. The apple dancers really stole the show — “the rounds of applause which follow the whirlwind finish prove without a doubt its popularity with audiences” and “[they] unfortunately appeared only once, although the audience would willingly have exchanged for their delightful antics some of the more sober moments of the show” commented some reviewers. They became local celebrities wherever they went. One dancer, Eunice Callen, appeared in the news after singing the song ‘L’ill yalla basket’ (a number one hit by Ella Fitzgerald and Chick Webb also called ‘A-Tisket, A-Tasket’) which hadn’t yet reached our shores. The apple dancers were also featured in the news when they performed for disabled children at Montrose Home in Corinda. How important were the Great Swing bands of the 30’s and 40’s to the culture and evolution of the dance we know and love today? Well, let’s just say that it is thanks to these musical entrepreneurs that we’re not milling ‘round dance floors today doing the ‘Sit’, the ‘Shuffle & Yawn’ or even the ‘Man it’s Late, I’d Better Be Truckin’ On Home’. How simple musicians came to awaken popular culture to the freedom of improvisation in music and movement in that huge grand ballroom is no fairytale, but it is a story with plenty of magic. As with so many turning-points in human social history, the glory days of the Savoy Ballroom, known for its great bands and great dancers, notably Frankie Manning, is characterized as much by what didn’t happen as what did. The management did not follow the practice of segregating ‘coloured’ staff from patrons, or of hiring predominantly white bands like its neighbour the Cotton Club and other well-known Harlem clubs. The first Bands to play at the Savoy in 1926 set the pace for the next two and a half decades. They were picked carefully for their innate talent and prestige within musical circles – often invited from the Jazz communities that were growing throughout the United States. They pulled together often unusual combinations of instruments, heavy on brass, and encouraged experimentation and soloing from individual band members. The Savoy bands achieved an important balance between teamwork and individual expression. The teamwork is evident in their tight musical arrangements, endless rehearsals and the immaculate care they all took with their instruments and appearance. Individuality shines through in the now classic ‘call & response’ that we hear in the music. Some music historians say that the musicians at this time used their instruments like voices, to tell a story, and that they entered into real dialogue with each other. Similarly, the singers who accompanied the bands are said to have used their voices as instruments. (Consider the scatting of Ella and the trumpet-like vocals of Louis Armstrong). Perhaps the real magic happens when dancers, moved by the stories they’re hearing, and the irresistibly dynamic nature of this ‘musical conversation’, get up and start using their bodies to tell their own tales. We know that the elite dancers of the Savoy would often come early in the afternoons to practice their moves while that night’s band rehearsed. Both the dancers and the band would test tempos and solo breaks with each other. But, if a band invited to play at the Savoy wasn’t able to keep the dancers on the floor, they were never invited back. Louis Armstrong is credited with much of the evolution of dance and music that happened at the Savoy. He took the New Orleans style of group improvisation, where all the players improvised simultaneously, one step further. He brought solo improvisation to an ensemble group. The swing ensemble became tighter and more organized, adding more instruments and calling for arrangements of whole sections rather than single instruments. Soloists were allowed greater and greater individual freedom to stretch out, in turn, one at a time. The dancers, following suit, stretched out in their solos too. All these changes in music created new feelings and sources for expression which came through the bodies of dancers. Fletcher Henderson and Duke Ellington, who expanded the musical concepts to include whole sections of an orchestra — helped develop swing music, and thus the dancing done to it. The rhythms called for a more syncopated basic dance step, and the allowance of time for musical improvisation within the musical structure, inspired the dancer to “go out” and improvise within the dance structure. Joe Jones (Count Basie Band) and Gene Krupa (Benny Goodman Band), introduced the many different sounds and textures that could be produced by the drums. Walter Page, bassist of the Count Basie band, played a four-beat walking bass, which added a new dimension to swing music. It travelled more, and added to the excitement of the dancers. Music, previous dances, social climate and reactions, and the desire to try something new, to create something specific to one’s own generation, all add up to the magical birth of a new dance and a new kind of dance band. The spread of Swing correlates well with the movements of the Savoy bands. The bands travelled, people travelled, Southerners influenced Northerners, Easterners influenced Westerners and bands toured other continents including Europe up until World War 2. During the thirty years it was open*, about 250 big bands are said to have performed on the Savoy stages. There were actually two bandstands so that there was live music all night without a break, and it often hosted ‘Battle of the Bands’**. The ‘house’ bands included Chick Webb’s orchestra (with the singer Ella Fitzgerald, and the saxophonist Louis Jordan) and the Savoy Sultans. Other bands that played there include those of Duke Ellington, Count Basie, Jimmie Lunceford, Benny Goodman, Artie Shaw, Cab Calloway to name just a few. Frankie Manning, voting with his feet, counts many of the Savoy bands among his favourites to this day. He celebrated his 85th Birthday party in 1999 to the strains of the Count Basie band (minus the Count) and George Gee and His Make Believe Ballroom Orchestra (including various Basie, Lionel Hampton & Duke Ellington original musos). Frankie’s personal collection of favourite toones includes Glenn Miller’s In the Mood, as well as other Swing classics. The list is heavy on the signature tunes of Basie, Ellington, Lunceford and Goodman with the odd Eskine Hawkins and Lionel Hampton number. The Savoy may have lost its clientele to Rock ‘n’ Roll in the mid-fifties and given up its powder blue walls and twin bandstands in 1959, but swing music lives on. To re-live the magic, we have a stack of resources at our fingertips – the recordings, the photographs, the stories and the dances. To read an account of the energy of a Savoy dance party – written by the man who was said to write jazz the way musicians played jazz – check out Otis Ferguson’s Swing tribute at http://www.thenewrepublic.com/jazz/harlem. Get swinging at our Gold Coast dance school and learn a fun social activity that will keep you fit. Call us for bookings or enquiries.